Meet the Quality Cinema community at the MEDIA Salles, AG Kino, Cicae reception. MAS, Mallorca Arts on Screen, makes its début this year. 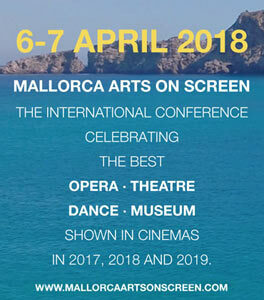 This is the first international festival specifically devoted to added content for the big screen, to take place in Mallorca from 2 to 7 April 2018, accompanied, on 6 and 7 April, by a meeting of professional players in the sector. The competition is organized according to four thematic areas - opera, dance, theatre and museum exhibition - with the addition of a special Award for the European Year of Cultural Heritage, as well as the screening of productions not competing for awards. The objective of MAS is to train the spotlight on the extraordinary opportunities provided by the digitization of movie theatres all over the world - a technological innovation that makes it possible to open up the enjoyment of cultural content to spectators who are fans of the big screen and to allow new sectors of the public to approach productions that up to the present have often been considered élite. MAS also intends to offer a venue for meetings and exchange between those who produce cultural content, those who distribute it and those who present it to the audiences in Europe's cinemas. Exhibitors and programmers will be able to see anticipations of the coming season and improve their ability to move in an innovative market sector with high potential for growth. MAS is promoted by a group of international partners and supported by the main players in the sector. This column hosts portraits of cinemas in Europe and the rest of the world which are quite different from one another but have in common the fact that they have all adopted digital projection. The fact that the Russians take great pleasure in the world of entertainment is proven by the myriads of theatres to be found in the big cities. First andforemost, of course, the elegant and majestic Bolshoi in Moscow. But dance and theatre, opera and music have an infinite variety of venues available for their audiences to meet and be entertained in. I have never seen such long queues outside theatres as in Moscow and Saint Petersburg, not even in New York! There is something ancestral in the Russians' devotion to the performing arts, especially in their adoration of dance, which must be linked to their ancient history and has survived over the centuries: I would even risk saying that for Russians the magic of the stage is atavistic, incorporated in their DNA. There are also many movie theatres in Moscow. The more traditional have been divided into different spaces, so as to offer several screenings a day. And in many cases they are open from the morning onwards. Several of them offer films in the original language with Russian subtitles. And this is a piece of luck for foreign visitors, too. The cinemas rival traditional prose theatres as regards magnificence and elegance; they offer not only comfort but also cutting-edge technology. Indeed, was it not the Russian, Sergei Eisenstein, director of "Battleship Potemkin", who revolutionized our ideas on shooting and editing, giving cinemas the opportunity to tell stories that would not fit onto a stage, thanks to deep perspective and the rapid succession of images? 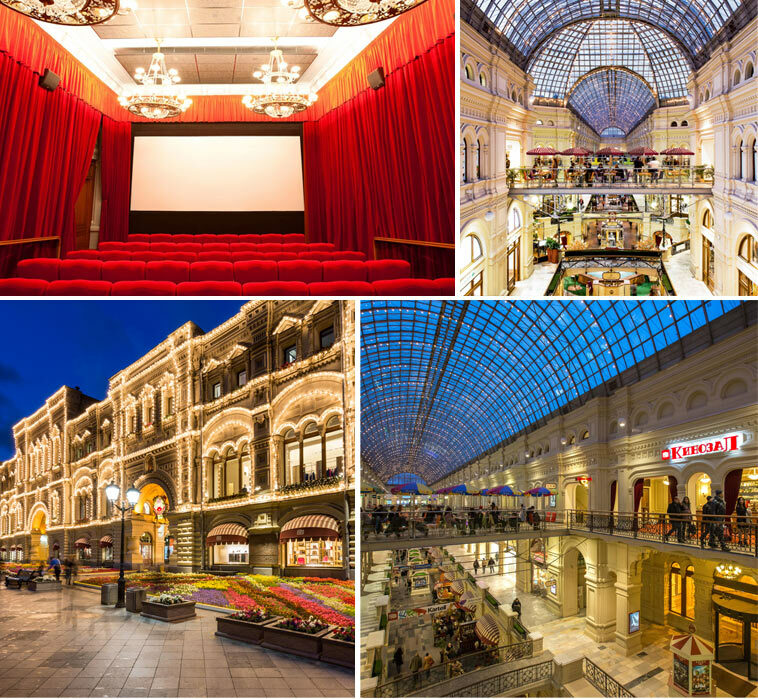 To help cultivate this passion for the seventh art, Moscow has 132 cinemas. One of them - right at the heart of Red Square - can be considered a trait d'union between theatre and cinema. At the end of the Nineteenth century, when Eisenstein was born in Riga - then part of the Russian Empire - in Moscow, still a city of merchants at the crossroads of the trade routes between East and West, the GUM stores opened. In 1890 they formed the biggest shopping centre ever built - 80,000 sq. m., three storeys, a vast staircase and iron railings - designed for the most prestigious goods coming from a wide variety of countries. The Tsar decided that the building should be paid for by the wealthy confederations of Muscovite merchants. The third floor hosts a cinema, not immense but certainly very special, with cut-glass chandeliers (a special varnish avoids them tinkling if subjected to low or high sounds), red velvet armchair seats and curtains of the same colour covering the walls and keeping out the light from the glass in the tall windows, when the screening starts; a strategy for improving the acoustics. The GUM cinema has three auditoriums today, all of which are digitized. The largest, seating 70, one for children with 20 seats, and finally a VIP hall. The latter, which seats a maximum of 16 spectators, is furnished with comfortable divanettes, where the spectator can even lie down, and has an equally prestigious bar, where it is possible to sip quality wine or enjoy a sophisticated snack, even during screenings. Particular care is taken over the acoustics, thanks to consultancy from one of the country's most technologically advanced laboratories. GUM is an independent cinema with its own programming. It offers premières, classic Soviet or foreign films and retrospectives, and welcomes special initiatives, for example when lending its auditoriums to the Jewish Film Festival in June. A ticket costs from 7 to 10 dollars - but not in the VIP auditorium! The cinema is open from 10 a.m. to 10 p.m., like the shopping centre where it is located. And it is the only place to have kept to its original function, even when, under Stalin, the Stores were transformed into one of the many locations of the giant Soviet bureaucracy. "ART CINEMA = ACTION + MANAGEMENT"
1st Round of Submission is now open!